About the author: An authority on the Japanese art of kendo, Dr. Gordon Warner is also an authority on all things Japanese and Okinawan. 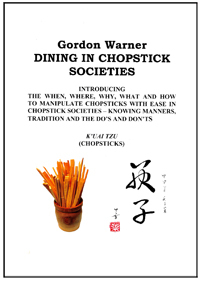 Having reside in Yonabaru Town Okinawa for many years, he introduces in this book the "when, where, why, what and how to manipulate chopsticks knowing manners and more. A great book to discover another side of Okinawa, Japan and Asia. Number of pages: 146 pages filled with photos pertaining to chopsticks.